It might be because all those adventure game episodes cost $5 a pop on Android. And I suppose that's fair - since each one will last you about 90 minutes (assuming you only play through it once), it's expensive by mobile standards. But today you have no excuse not to check out Tales from the Borderlands, the adventure game series set in 2K's over-the-top sci-fi shooter universe. The first episode, Zer0 Sum, is now free. That means you can download it and jump into the story of company man Rhys and tawdry trickster Fiona for nada, gratis, and nothing. 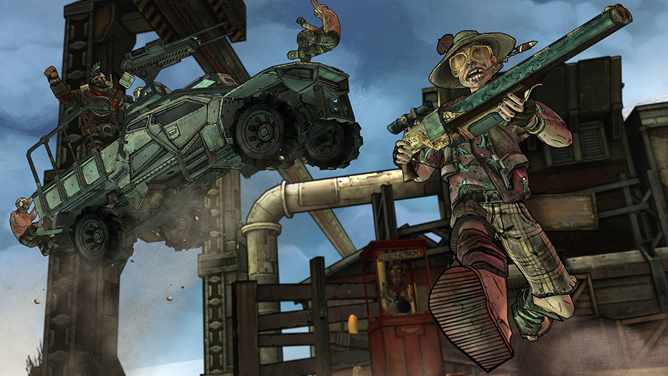 The story and characters in Tales from the Borderlands manages to beat out anything that 2K and Gearbox have come up with over three massive shooter games (which admittedly aren't all that great in terms of story anyway), so you owe it to yourself to try it. The game is compatible with external controllers, though you don't really need one for the point-and-click gameplay, and Android TV. If you enjoy the story, subsequent episodes are $5 a piece, or $15 for all four after the first one.